JamesMadisonLibrary is a Legacy Library. Legacy libraries are the personal libraries of famous readers, entered by LibraryThing members from the Legacy Libraries group. » James Madison's legacy profile. JamesMadisonLibrary is also an author. 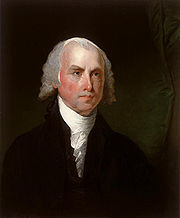 » See James Madison's author page. About meJames Madison (16 March 1751 - 28 June 1836), Virginia lawyer, diplomat, and statesman. Known as the "Father of the Constitution," Madison was influential in the creation and adoption of the federal Constitution, and later the Bill of Rights. He served as a leader in the early U.S. House of Representatives, as Secretary of State under Thomas Jefferson (1801-1809), and as the fourth president of the United States (1809-1817). From 1826 until his death, Madison acted as Rector of the University of Virginia. About my libraryMadison's library is being cataloged using a database compilation from collections at the Library of Congress, the University of Virginia, a number of auction catalogues of major sales of Madison’s library, and from the published volumes of the Papers of James Madison.